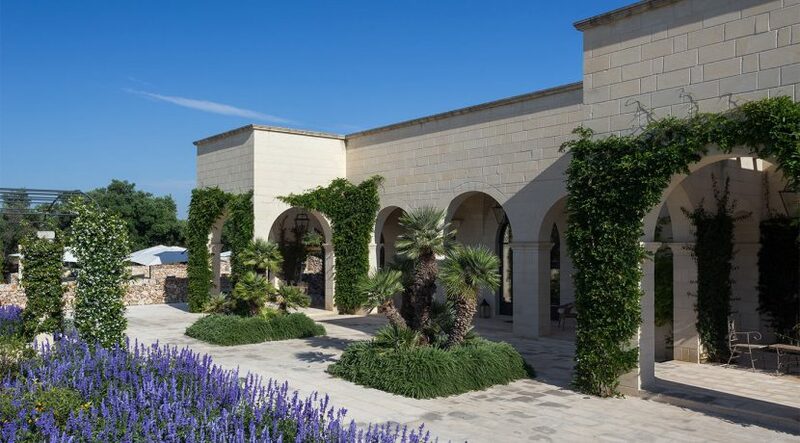 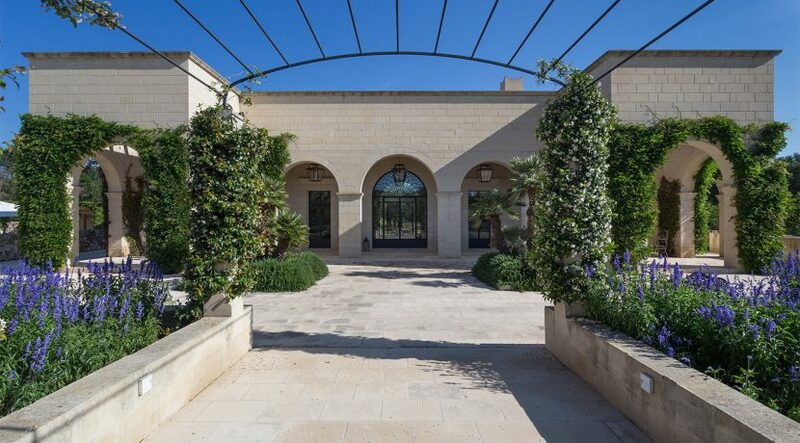 This luxury Puglia villa is set in over 3 hectares of tranquil olive groves and minutes from some of Italy’s most scenic coastline. 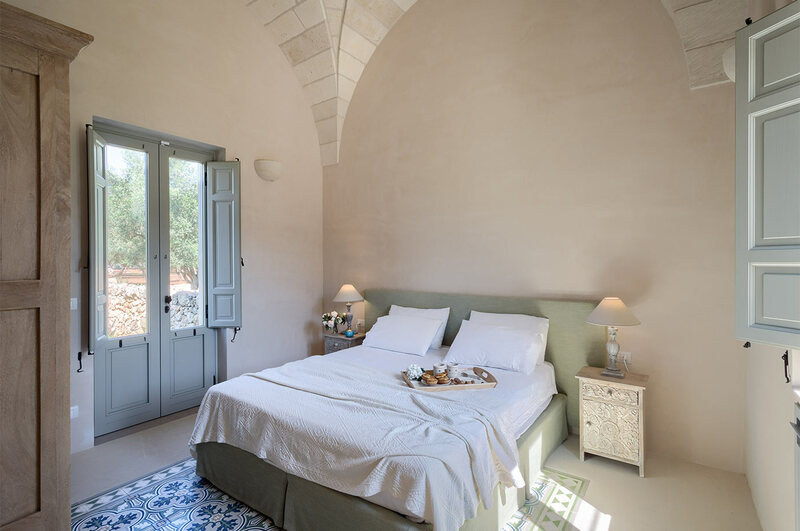 This country jewel combines rustic charm and modern comfort into an ideal holiday refuge. 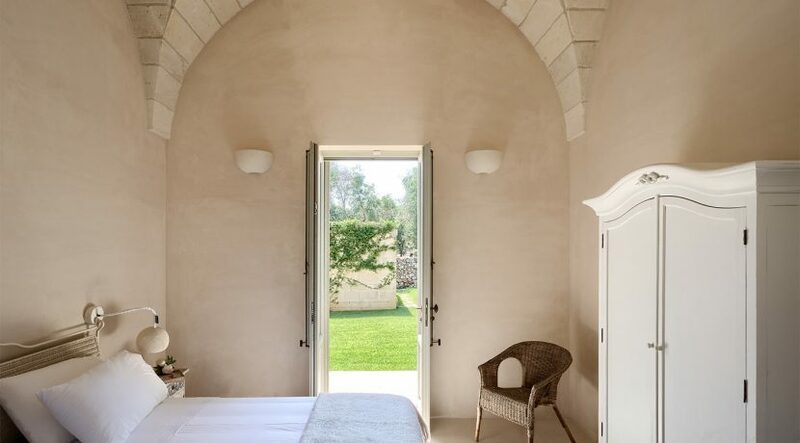 Masseria L’Aurora is a contemporary reinterpretation of a “masseria” – the traditional fortified farmhouse of rural Puglia. 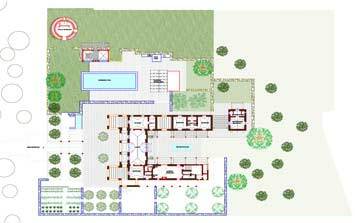 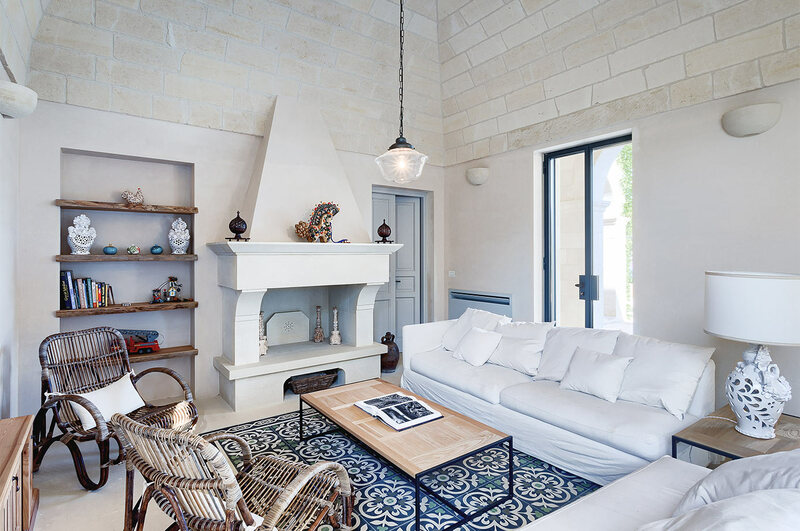 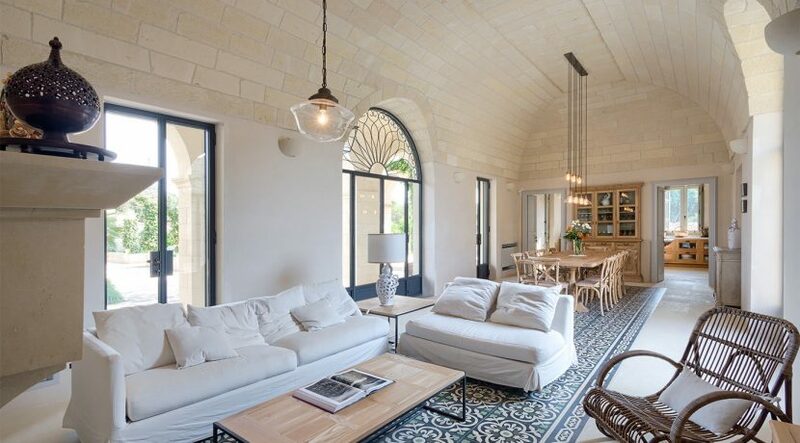 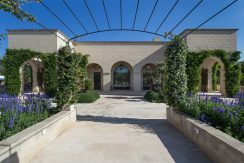 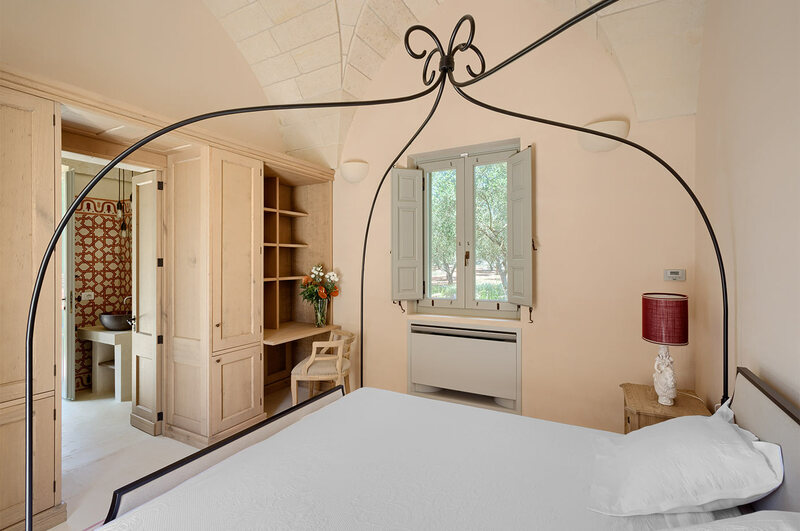 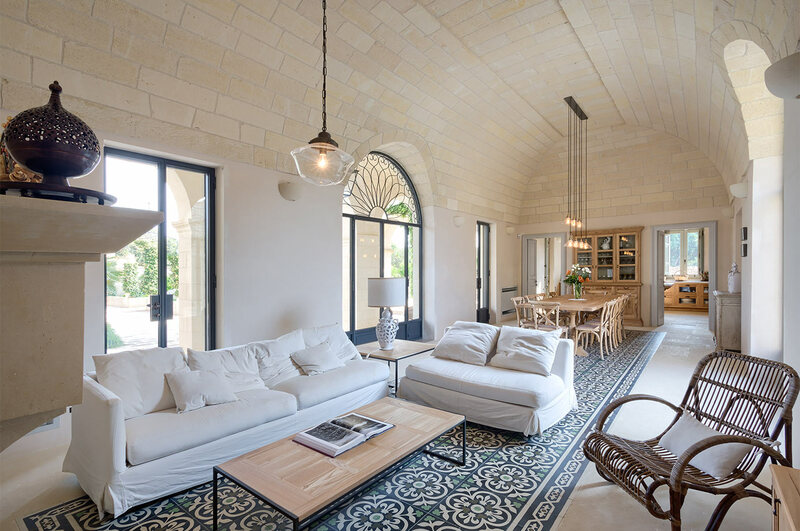 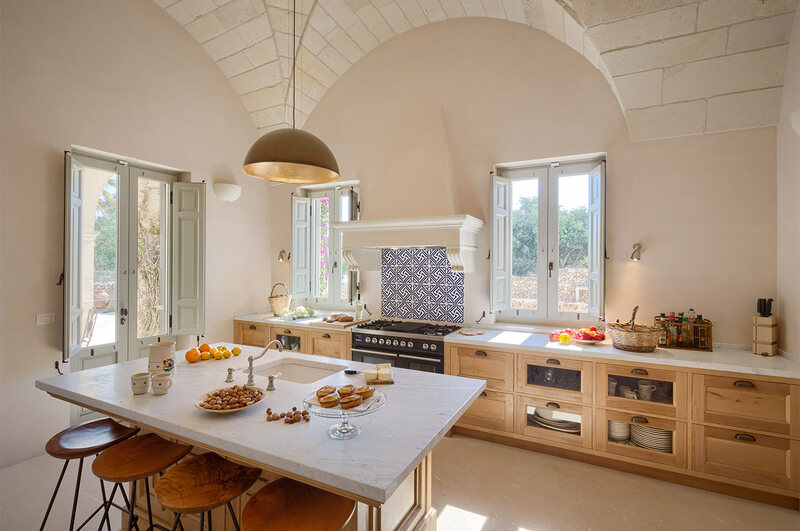 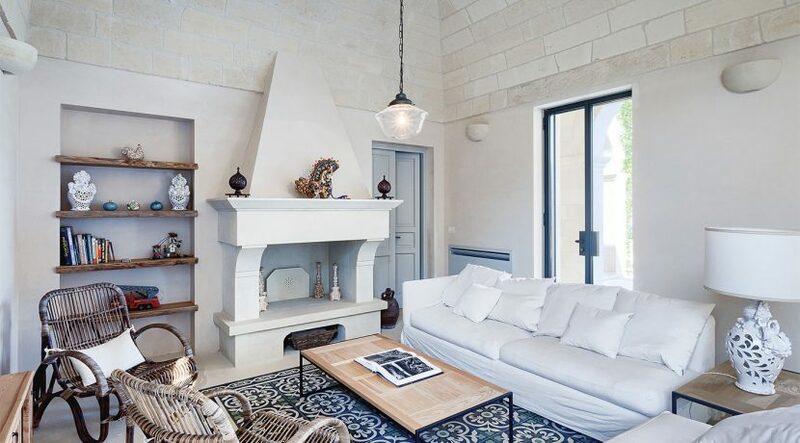 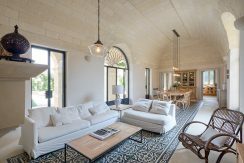 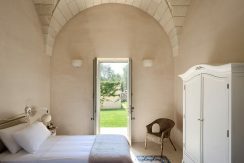 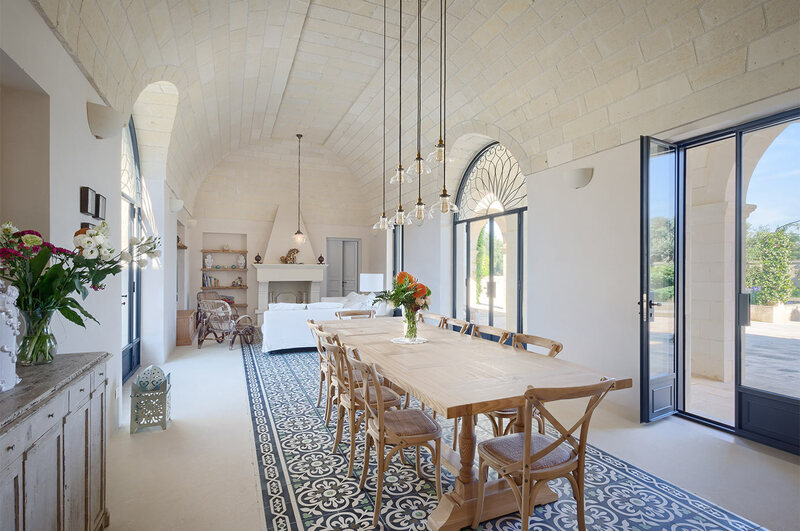 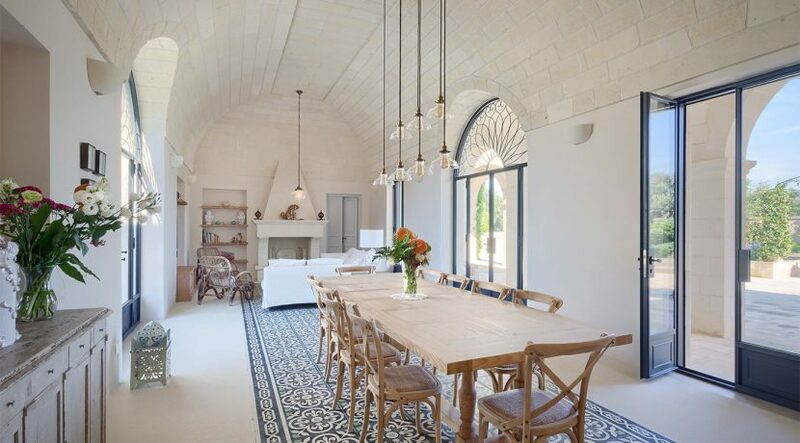 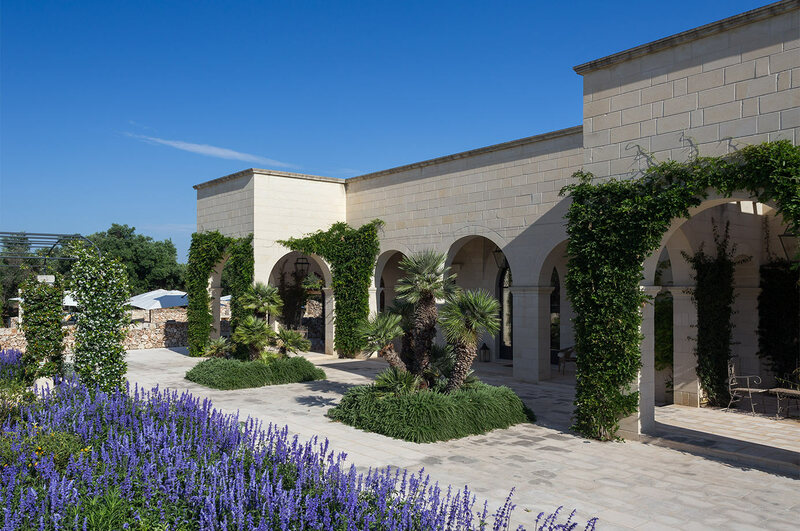 The main house is constructed in beautiful local pietra leccese limestone, with vaulted ceilings and elegant archways. 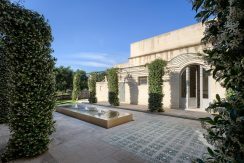 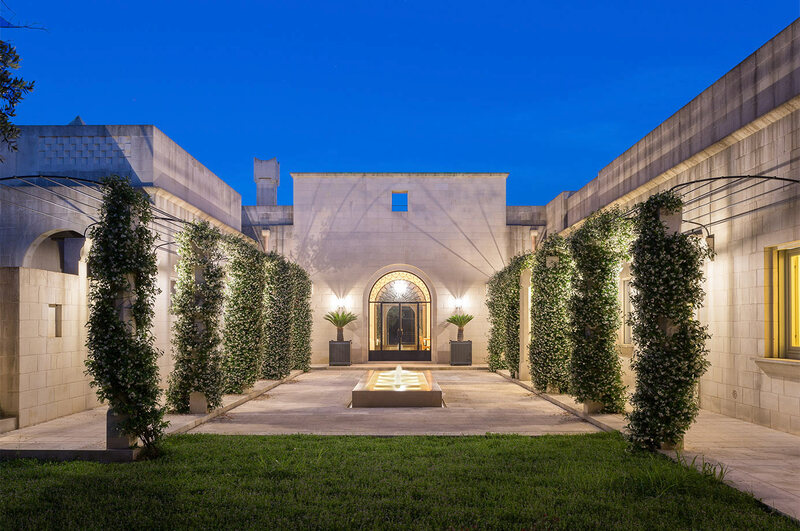 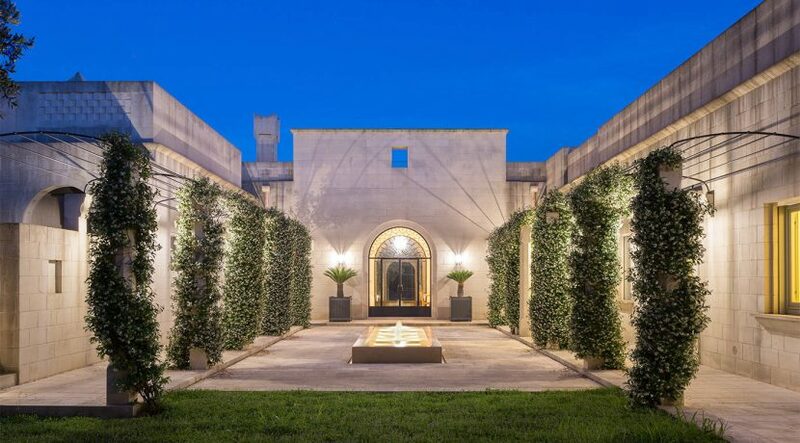 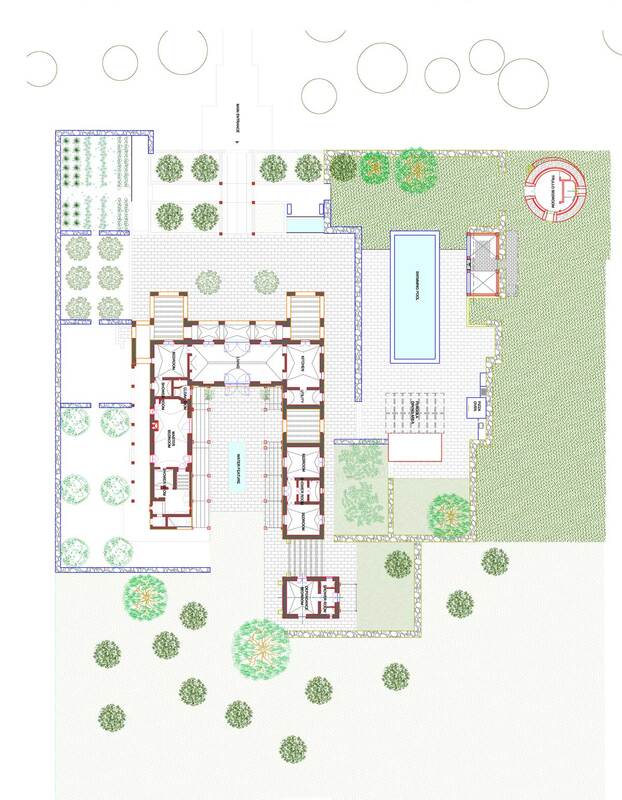 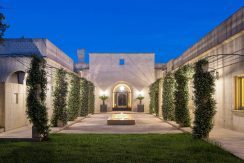 It set in a walled enclosure featuring porticos, trellised courtyards, fragrant gardens, soothing fountains, fruit orchards, a beautiful swimming pool, and ample outdoor seating and dining areas. 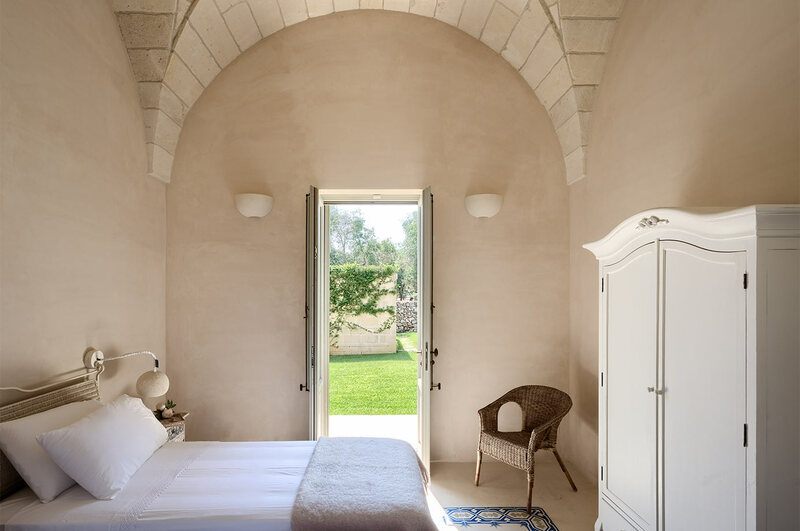 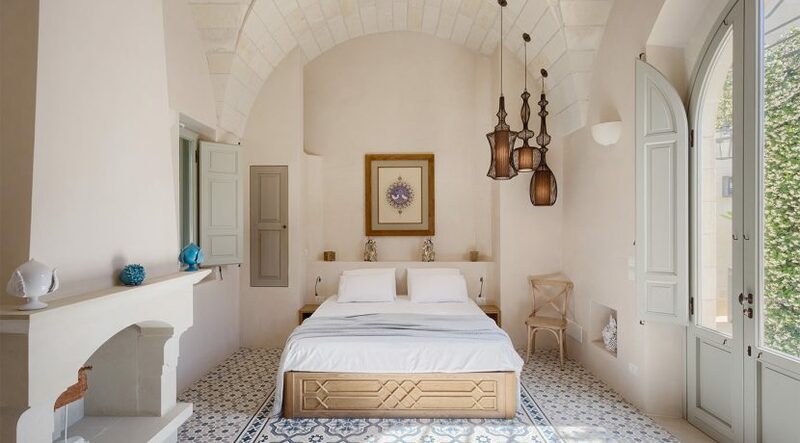 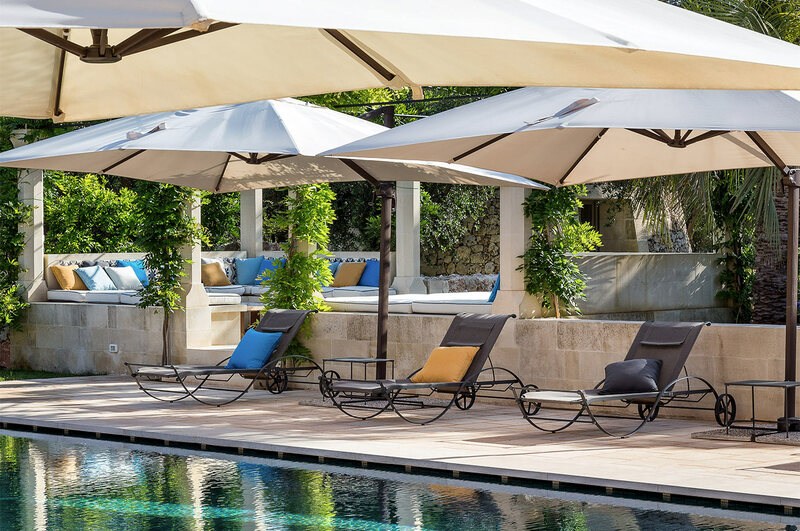 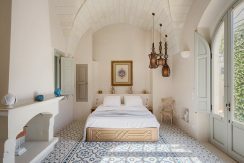 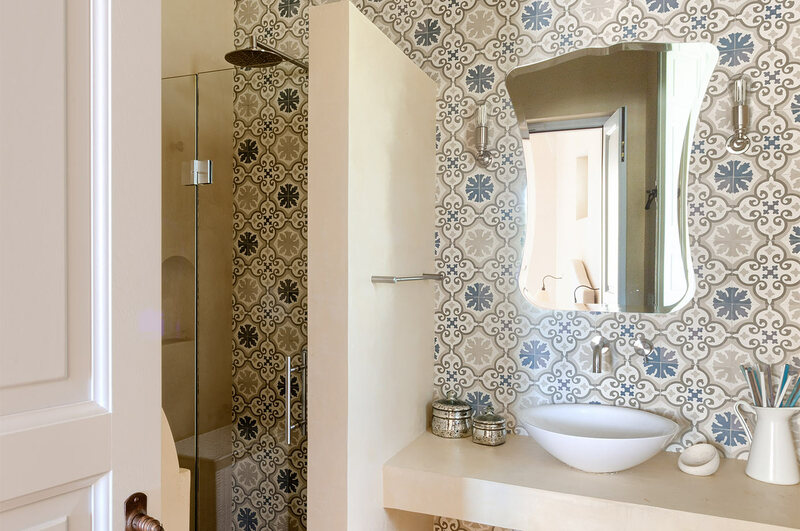 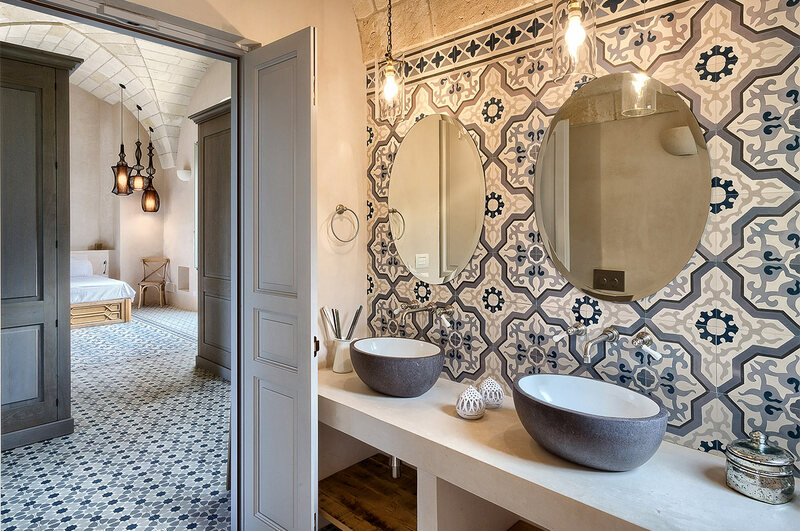 Inside, the masseria is furnished in a contemporary Italian country style, emphasizing comfort and elegant simplicity, with an occasional exotic touch. The area’s rich artistic traditions are on display in the furniture and decoration, much of which is made by local artisans. 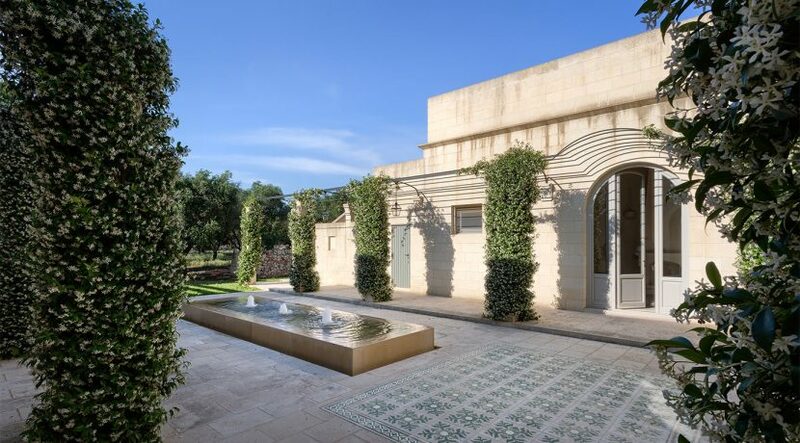 The barrel-vaulted great room (combined living and dining space) serves as a welcoming communal gathering place as well as the masseria’s architectural center of gravity, connecting the two wings of the house and separating the grand entrance courtyard to the south from a more intimate, colonnaded inner courtyard, off of which the private spaces are located, to the north. 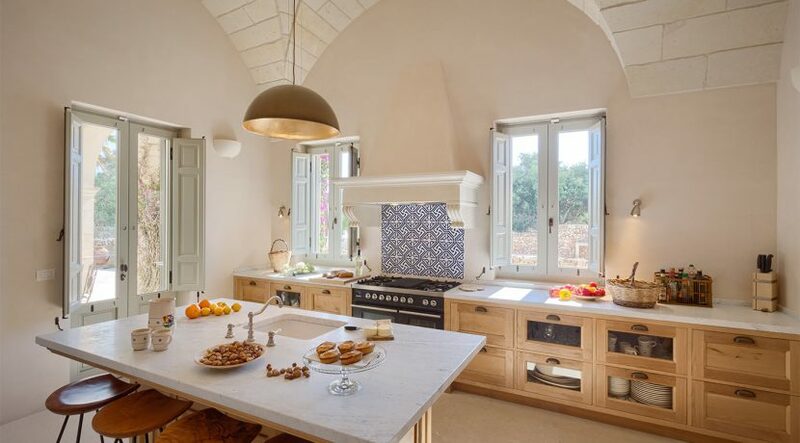 The kitchen features Carrara marble countertops and oak cabinets handcrafted by a local master carpenter. 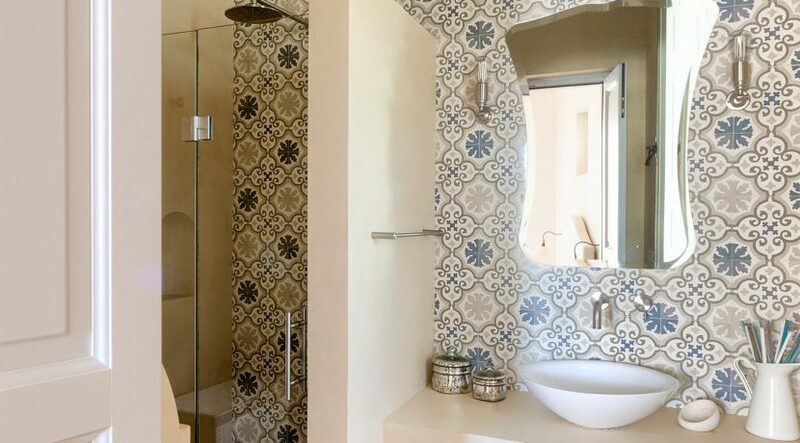 This and the adjacent utility area are fully equipped with modern appliances, including a spacious refrigerator, dishwasher, microwave, and washing machine. 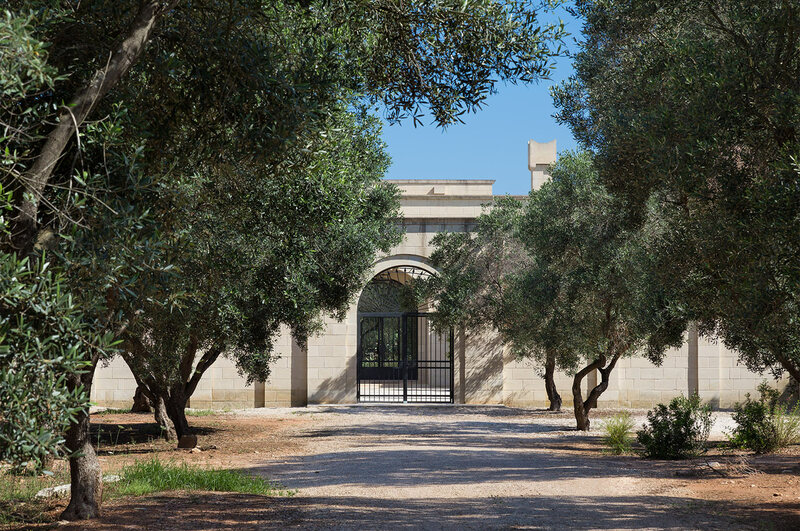 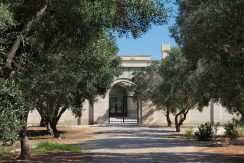 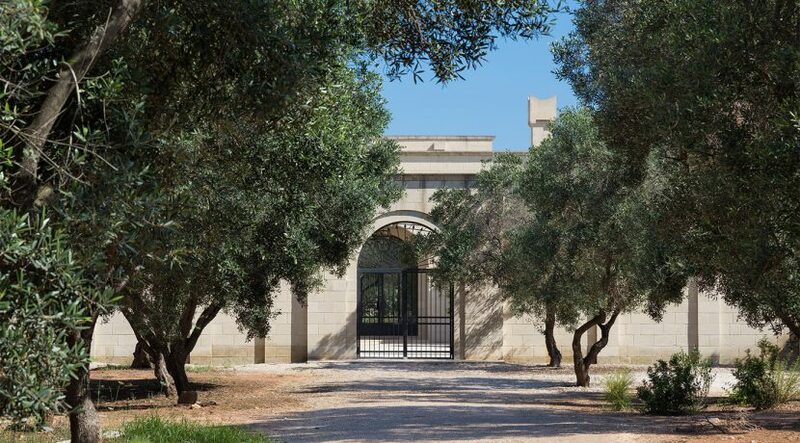 Beyond the masseria walls guests can explore the property’s 3.34 hectares of olive groves, with many trees that are centuries old. 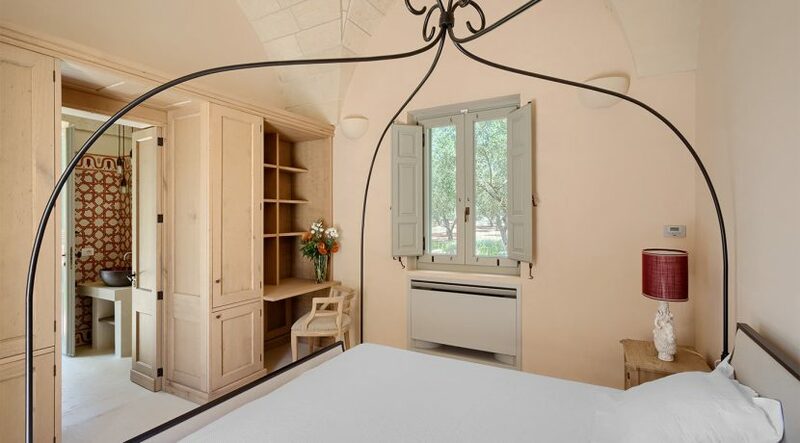 There are six charming bedrooms. 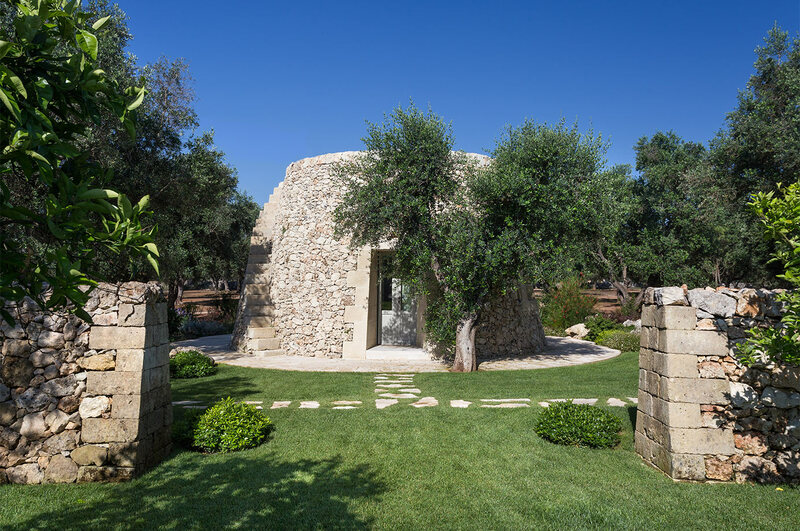 Four are off the inner courtyard, there is a guest bedroom adjacent to the great room and the sixth bedroom is built in a lovely trullo located behind the pool area. 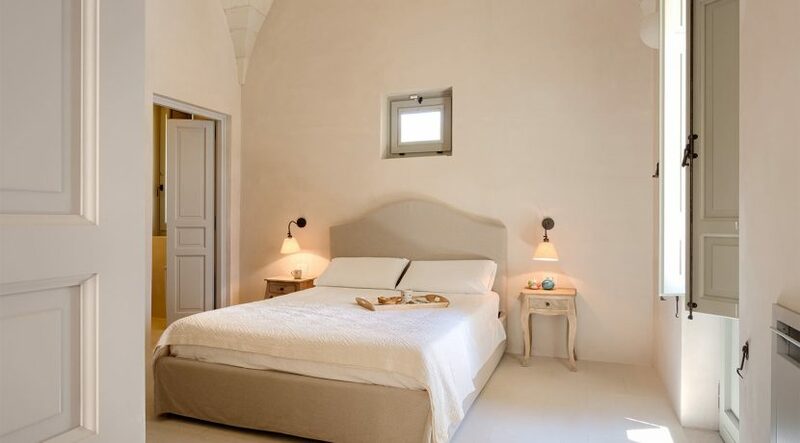 The spacious master bedroom occupies most of the eastern wing of the house. 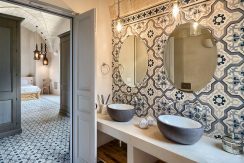 More than a place to sleep, it offers an atmospheric inner sanctum, with arabesque accents, views onto the tranquil fruit orchard, and a private landscaped courtyard with outdoor shower. 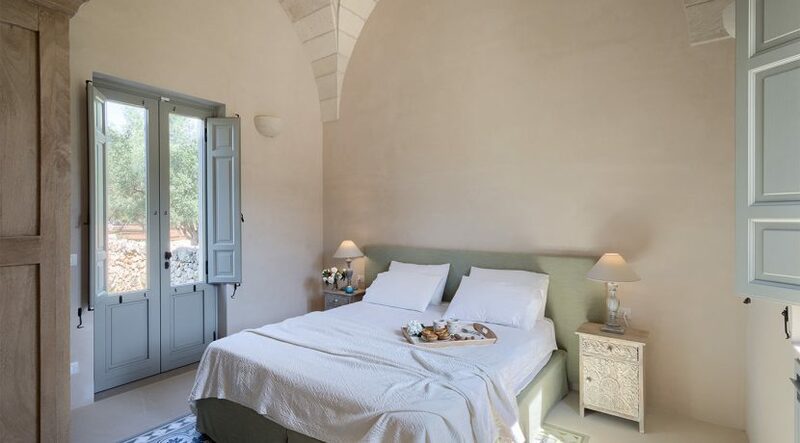 In the annex there is a fourth bedroom with an en-suite that enjoys a pleasant privacy, as it does not interconnect with any of the other rooms, and a special view on the olive grove. 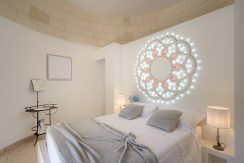 The guest bedroom enjoys an en suite bathroom. 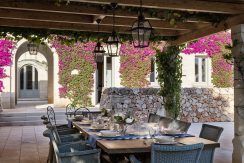 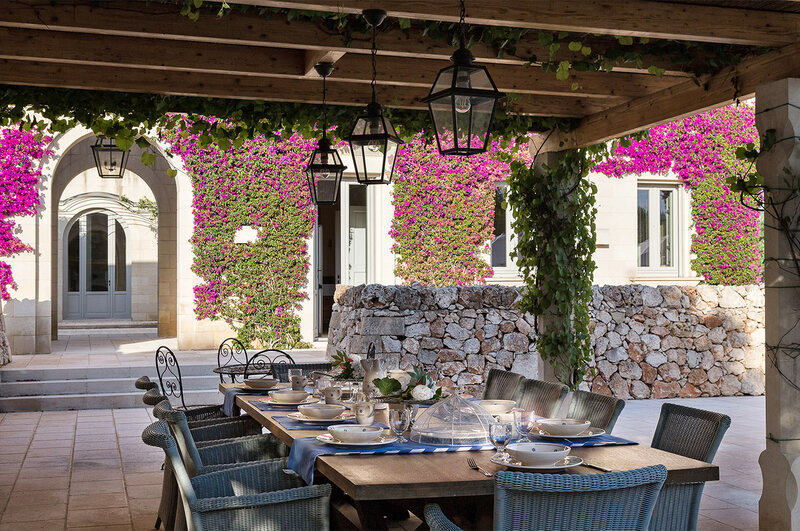 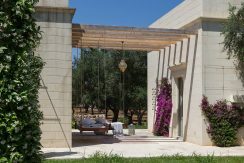 There are doors that open onto a trellised patio off of the masseria’s entrance courtyard, with impressive arches and exuberant bougainvillea. 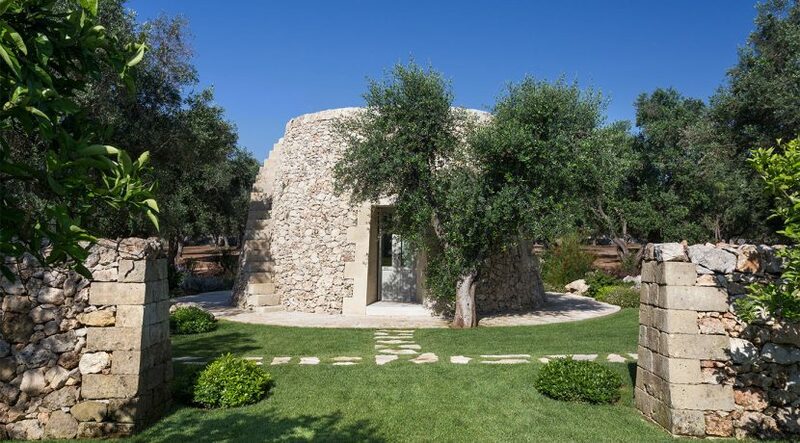 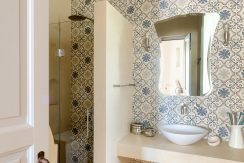 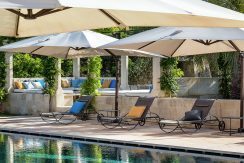 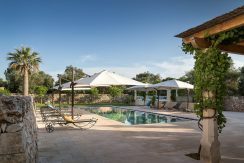 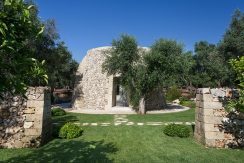 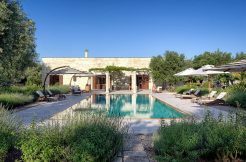 Behind the pool area the new-built trullo, surrounded by the ancient olive trees, hosts a cozy double bedroom with an en-suite bathroom and wardrobe. 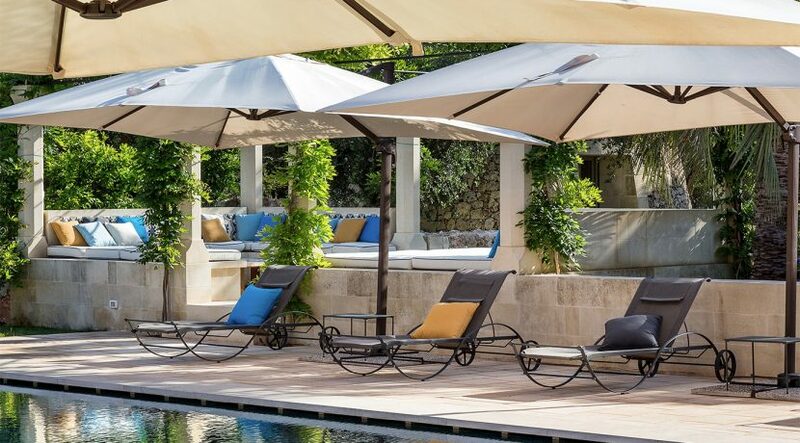 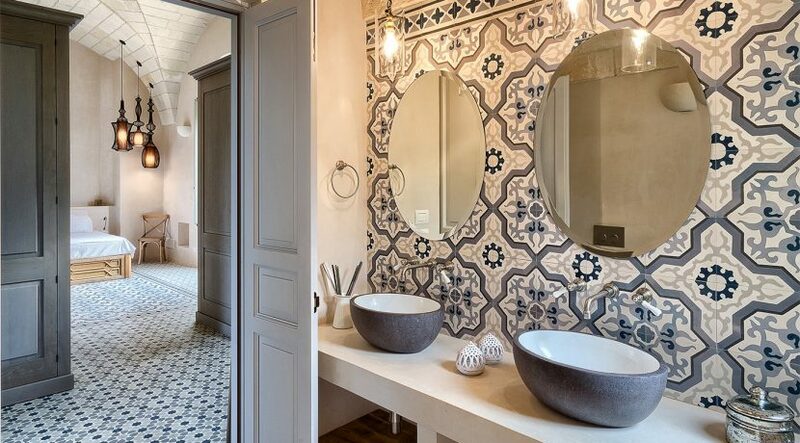 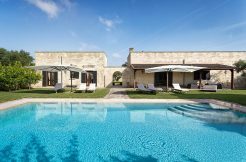 The Puglia villa, Masseria L’Aurora, is located in the heart of the Salento countryside just a couple of minutes’ drive — or a half-hour walk — from the central piazza of Carpignano Salentino, one of almost 100 charming towns that dot the provincial countryside around the city of Lecce. 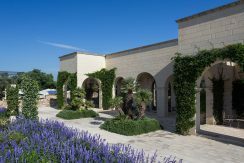 In addition to typical coffee bars and trattorias, Carpignano offers basic conveniences such as a modern supermarket and pharmacy. 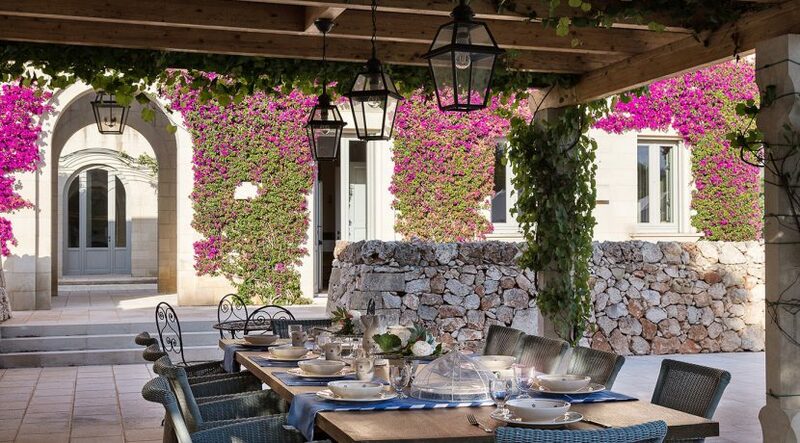 The nearby towns are home to many more restaurants, as well as cultural attractions such as castles, churches and festivals. 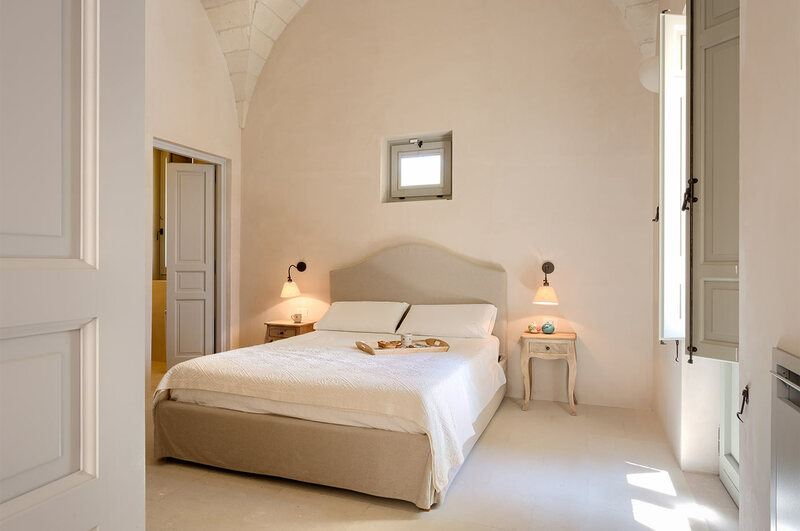 Just 10km away are the stunning coastline and crystalline waters of the Adriatic Sea. 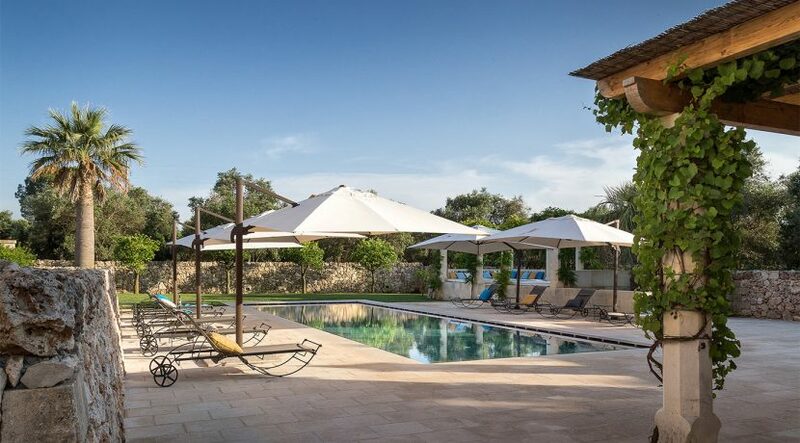 Broad swathes of sand and lively Italian lidos welcome you at the beaches of Alimini and Torre dell’Orso. If you prefer more secluded, rugged swimming spots, then Torre Sant’Andrea or Baia dei Turchi are beyond compare. 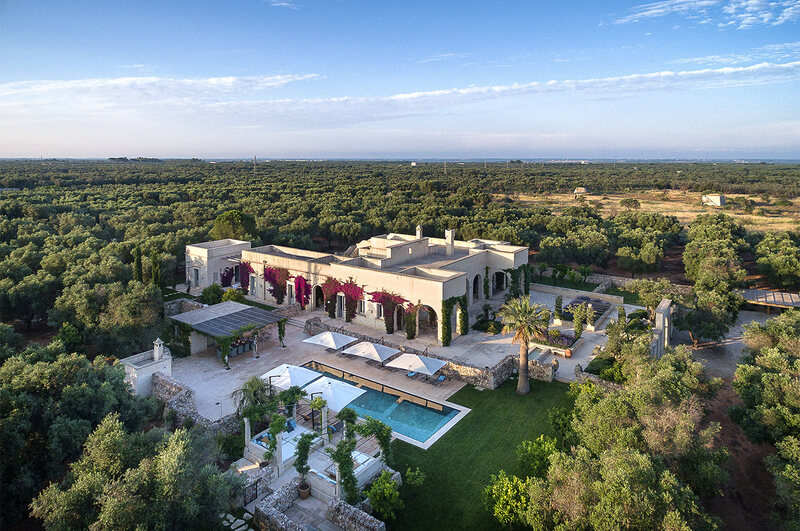 Just a few kilometres down the coast also lies the historic town of Otranto, with its scenic setting and impressive cathedral and castle. 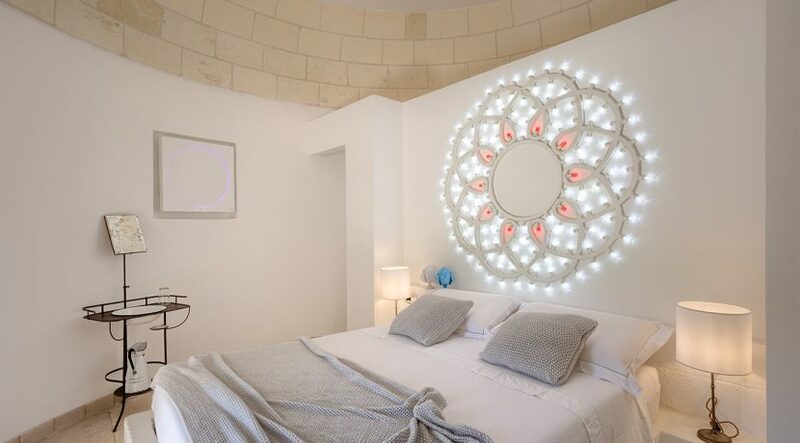 The spectacular city of Lecce, often called “the Florence of the South”, is less than a half-hour drive away. 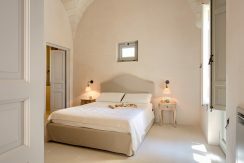 The lively historic center – built entirely in pietra leccese and in the baroque style for which the city is famous – is packed with dazzling architecture and quaint streets, as well as countless atmospheric shops, restaurants, and bars.